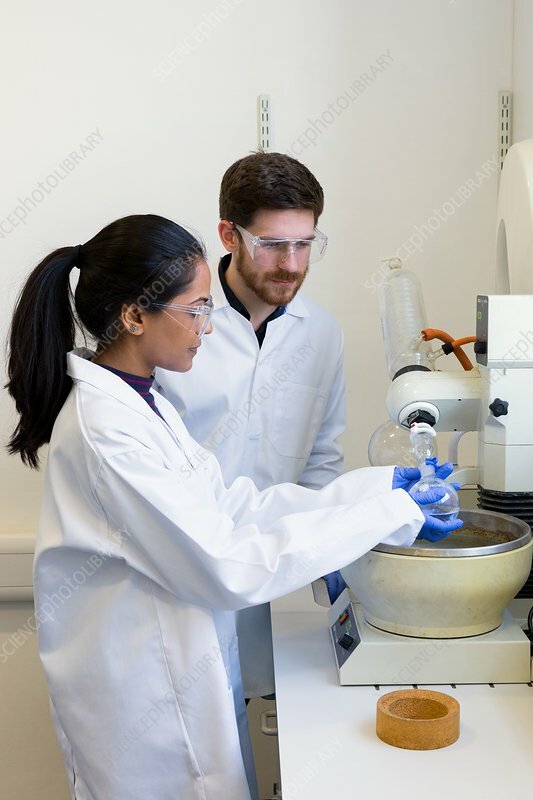 Chemistry students in an undergraduate teaching laboratory attaching a round bottom flask containing their solution to a rotary evaporator. Once fixed into place, with a blue clip, the round bottom flask can then be lowered into the hot water bath and a vacuum pump (bottom right) is used to lower the pressure in the flask, allowing it to boil. The flask is rotated to prevent violent boiling. Any solvent removed during this process is collected in the collection flask, leaving the dried product in the round bottom flask in the water bath. This technique is used when the product would be damaged by the high temperatures associated with boiling the solvent off at atmospheric pressure.